Can a font change the future? On her first day back at the University, a rogue Professor sets out to avenge her missing husband – and the lost art of ink on paper – by conducting a dangerous lesson on typography. When the Professor’s lecture jumps the rails, we peer into a near future where desperate people search for the tangible in an ever more virtual age. Most futuristic, dystopian thrillers don’t, of course, make a lick of sense. Happily…we have already grown fond of the play’s harried typography professor (Katigbak), whose font expertise has made her a target of our Google-ish overlords. Couple that affection with a delightfully polished physical production – one of David Evans Morris’s set changes made me burst into mental applause – and futura has no trouble making its mark. For the first, enormously appealing section, Katigbak treats us like students, lecturing on print from Gutenberg to her Fahrenheit 451 – like present day. Katigbak’s stern affect serves her well; in seasons past, she has terrified us as both Creon and Mother Courage, so no wonder she overwhelms the terrorists who eventually swarm out to kidnap her. A lecture on the history of typography is probably not what most people expect during a night out at the theater. 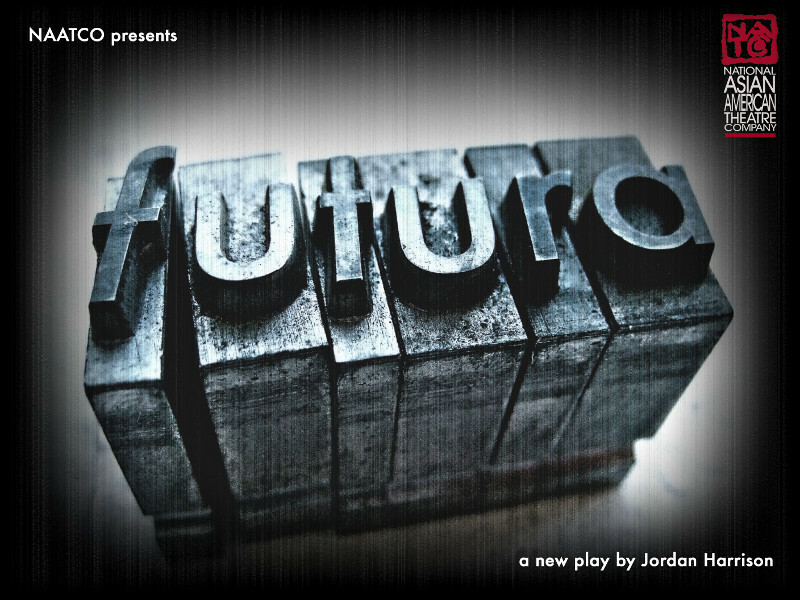 And yet, Jordan Harrison’s intriguing new drama futura presented by the National Asian American Theater Company at TBG Studios, begins with a rather lengthy speech on just that. Thankfully, as delivered by Mia Katigbak as Professor Lorraine Wexler, the lecture proves to be an insightful and entertaining one filled with juicy facts and told with dramatic flair. Harrison is clearly and cleverly extrapolating from our contemporary society’s ever-growing trend towards digitalization. The play is bound to inspire plenty of laughter of recognition, and serves up a cautionary tale about what may be lost as technological advances change the way we think and the way we write. A lecture about fonts seems hardly the kind of fascinating set-up with which to start a play, but that’s exactly what begins Jordan Harrison’s new play futura, now playing at TBG Theatre as part of the National Asian American Theatre Company’s current season. The play, set in the not-so-distant future, focuses on a professor (the magnificent Mia Katigbak). The professor’s lecture at the start of the play is most captivating. Typography registers as a surprisingly lively and engrossing topic during the first 20 minutes or so of Jordan Harrison’s futura. In this opening sequence, Professor Wexler, portrayed by Mia Katigbak with a compelling underlay of simmering passion beneath a professorial manner, discourses in a smartly illustrated lecture on the history of typefaces. She goes from Gutenberg’s heavy gothic letters to the streamlined look of the 20th-century design of the title. At the podium is the Professor (Mia Katigbak), who speaks with the simmering brusqueness of someone who has nothing to lose. Fonts are one of those things we rarely think about, and by weaving their evolution into stories of World War II and the French Revolution, she does what great teachers do: she makes us rethink the world around us. futura does hit an anxious nerve. Let’s face it: a dystopian nightmare about the death of publishing as we know it is a pretty good idea for a play. There’s a lot to enjoy in Jordan Harrison’s futura, a play bristling with ideas about the near future of human communication and thought – and about our paradoxical relationships to technology and each other – given a stylish production by director Liz Diamond and the National Asian American Theatre Company. I was captivated by the swirl of ideas, by the way Liz Diamond’s staging meshes with David Evans Morris’s ingenious Russian-nesting-doll of a set, and, above all, by the relationship between the Professor and the most conflicted of her captors. An excellent actress, Mia Katigbak is compelling and engaging to the point where we are almost ready to accept futura as a one-woman play – until the lights suddenly go off, wiping the Professor’s image from the stage and her font samples from the screen. Lorraine and Gash make a very strong duo, which helps to maintain the play’s strengths . When Lorraine fulfills Gash’s penmanship wish, we are truly touched as she places a pen in between Gash’s stiff fingers and holds his hand while he learns to scribble words on a rumpled piece of paper. With that simple act, Mia Katigbak and Christopher Larkin [Gash], who is the second strongest actor in the play, deliver the emotional turmoil of the not-so-distant future they live in, as well as the faint hope that mankind can find its way back to the days of informational freedom, be it by the means of electronic warfare, the mysterious Zero Drive, or one script letter at a time. Put futura on your radar, and take in a worthwhile evening of provocative non-digital entertainment. Dr. Lorraine Wexler, an academic and (as we will learn) figure of scandal, gives a lecture on the history of typefaces. This subject is more exotic than you might think, because we’re in the not-so-distant future, when only digital technology is used for communication. “Yes, it’s real,” Dr. Wexler says, holding up that rarest of objects, a piece of paper, carefully preserved in plastic laminate. Dr. Wexler’s lecture is informative, funny, and filled with intimations of a society in which privacy has been erased and “a civilization with a billion books became a civilization with one book,” resulting in a kind of collective body of knowledge that allows for neither dissent nor individual expression. Produced by special arrangement with The Theatre@ Boston Court, Pasadena, CA and Portland Center Stage, Portland, OR. FUTURA was developed by NAATCO & New Dramatists as part of New Dramatists’ Full Stage NYC, a program made possible by New York City’s Theater Subdistrict Council and Time Warner.